Distributors for US Biomax, Inc.
News: Viewing high magnification power images (100x - 400x) from each tissue array core is now available for almost of all tissue arrays. Click Core Images Tab in the specification sheet page to view the scanned images up to 400x amplification through FullScanViewer provided by US Biomax. For example, 616 core high-density array or 208 core high-density array and 96 core array. News: Download high resolution H&E images (.svs format) free of charge after purchasing unstained or H&E stained slides, available after registration and complete order. Disease spectrum tissue arrays (cancer progression) are available. Please browse our Tissue Microarray page to find out from each cancer type only produced by US Biomax! We have pre-cut histology paraffin (FFPE) tissue sections, including normal human paraffin sections HuFPT, human cancer paraffin sections, HuCaT, and normal rhesus paraffin tissue sections, RhFPT and normal cynomolgus (cyno) monkey paraffin tissue sections, CyFPT. Formalin fixed, paraffin embedded histology tissue sections are ideal choices for rapidly localizing DNA, RNA and protein markers. The tissues were fixed by formalin no longer than 48 hours, and then processed to be ready for sectioning. 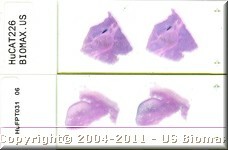 Two serial tissue sections with 5 µm thickness are mounted on a SuperFrost Plus glass slide. US Biomax histology paraffin tissue section is perfect for fast detection of genes and proteins expression in specific tissues of different species.